Here you'll find simple tips to keep your plant friends happy and healthy. Indoors; provide bright indirect light. Water at base of plant, enough to saturate the soil, only when soil is totally dry (~3-4 weeks). WATERING TIP: I will hold the piece under a gently running faucet, giving the plant a saturating drink. Then I will gently tip the piece upside down to drain any excess water, making sure to keep a hand cradling the plant so it doesn’t fall out. If getting more light may need to be watered more frequently. Water liberally once every 10 - 14 days. If very hot and dry water every 7-10 days. Remove any fallen, soggy or dried leaves. Water sparingly at base of plants once every 2-3 weeks in hotter months, and every 3-4 weeks in cooler months. Only water if soil is dry. If plant starts to look like its stretching out move to area with more light. In containers with no drainage, water sparingly at base of plants once every 2-3 weeks, and only when soil is dry. In containers with drainage holes, water more liberally once every 7-10 days, or when soil is totally dry. Indoor or outdoor; bright indirect light. Mist, aiming for the moss at base of plants, every ~7 days. mist more often in hot & dry weather and less often in cooler & wetter weather. Every now and then (every other month or so) water more liberally. Once plants begin to outgrow the art pieces, trim them back & replant cuttings in ground or containers. Soak your airplants, upside down, for 30 minutes every 1-2 weeks. Shake out any excess water and allow to dry (upside down) near a window for about 4 hrs. Succulents like bright indirect light. Many of the flower shaped varieties (Echevaria, Graptopetalum, some Sedums, etc.) require bright sunlight or will begin to stretch and lose their compact flower shape. While many prefer to be outdoors many will thrive indoors as well! Some varieties that do better in lower light conditions include the Haworthias, Gasterias, Aloes, Agaves, Cacti, Panda plant, Cacti, some Sempervivum and even String of Pearls, and String of Hearts. 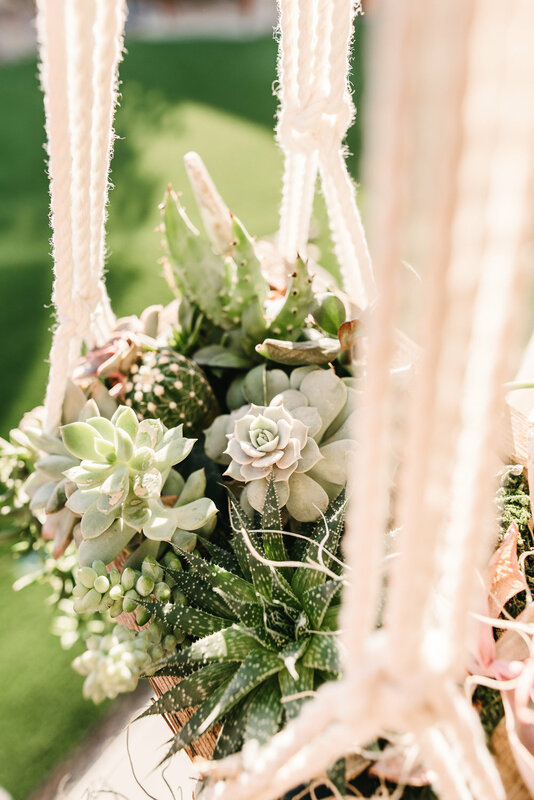 Succulents (and cacti - which are types of succulents) are plants that store water in their leaves and stems - making them great water-wise plant options. Now this doesn't mean that succulents don't ever need to be watered. They do. But it does mean that they don't have to be watered as often as most ornamental and house plants. The most important thing to remember when watering succulents is to make sure that soil is completely dry before watering. A good rule of thumb is "when in doubt dry it out!" I water my outdoor succulents once per week in hotter conditions and once every 2-3 weeks in cooler and wetter conditions. I also fertilize once per month during the spring and summer months (except for my Aeoniums which I fertilize in early winter months). Most of my indoor succulents are planted either in terrariums or in pots with no drainage holes so I water very sparingly (so as to avoid root rot). Terrariums, I water once per month with a water dropper (just enough to saturate root area of each plant) and arrangements and indoor pots I water every 10-14 days.